The last time we saw Lt. Binky his space station had a visitor, a fellow space cat, in Binky Under Pressure. He dealt with that threatening situation with such aplomb, FURST (Felines of the Universe Ready for Space Travel) has given him a new challenge - training new recruits. But what happens when the kitten cadet is not even a kitten? No worries, Binky can handle it! My kids love how seemlessly cat life blends into space training. How can you tell if your cat's schedule of eatting, napping, making alien decoys, napping, and eating, is actually that of an undercover FURST (sorry, PURST! Pets of the Universe Ready for Space Travel) agent? It's worth mentioning that my son's new favourite phrase is "sure as fuzzbutt." Spires sure has a way with a simile. It's also worth mentioning that this edition of Binky's adventures has a great moral of playing to your strengths, even if that means coopting a soccer ball into an alien-fighting technological device (which horrified my son!). Binky's adventures are a perfect first comic series, with great visual gags to keep the kids interested even when encountering new vocabulary. 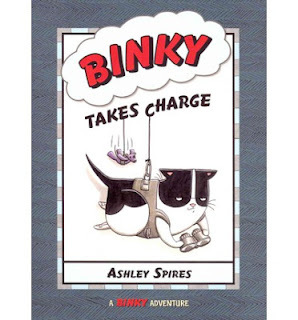 Binky Takes Charge is a great addition to this addictive series. Binky Takes Charge has been nominated for a 2012 Cybils award in the Graphic Novel category. This is the twenty-sixth book I have reviewed for the Sixth Canadian Book Challenge.